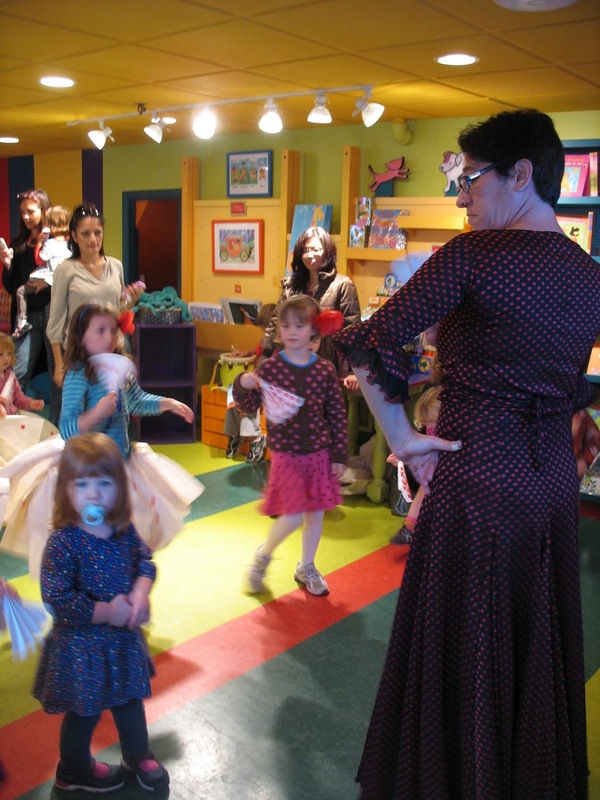 Last Sunday found me at Barefoot Books Studio in Concord, MA for a 90-minute event to kick-off a new Barefoot Books title, Lola’s Fandango, by Anna Witte. Illustrator Micha Archer was there to celebrate the launch of this distinguished new Barefoot Books title and she gave a reading at the studio’s whimsical storyteller’s throne. She followed this with a craft-making activity of creative, fun wearable crafts (skirts, flowers, fans, and bow ties!). 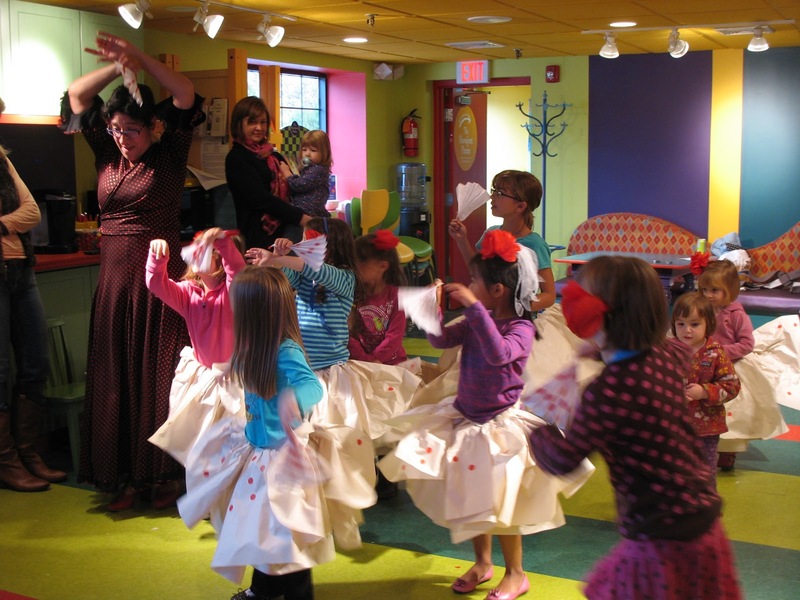 To top this wonderful afternoon off, I offered the adorable participants a flamenco demo and then enlisted them in a follow-me flamenco dance in the wonderful, cheery studio! With flamenco fans held high and shouts of ¡Olé! we paraded around the studio stomping our feet and swishing our skirts! Lola’s Fandango is a story about a little girl named Lola who discovers one day that her mother (Mami) used to be a very good flamenco dancer. Lola secretly learns to dance a traditional flamenco dance, Fandango, from her father (Papi). Papi first teaches Lola the rhythm of the dance and then how to stomp her feet. And finally, he teaches her how to move her arms and hands. Lola practices, gaining confidence and developing the spirit (Duende) and attitude needed to be a great flamenco dancer. I won’t tell you anymore but the illustrations are beautiful and colorful and fully capture the fire of flamenco! I was very pleased with the authentic use of flamenco in this book. Two points of note are the onomatopoeia of Lola’s dance shoes “toca toca tica” and the repeating rhythm of the Fandango: 1-2-3, 4-5-6, 7-8, 9-10, 11-12 (the count that is represents the base of all flamenco 12-count rhythms). A special treat is the CD that accompanies the book, narrated by the Amador family of the Pan-Latin musical and singing ensemble Soly Canto, includes flamenco music and real foot stomping in the background. 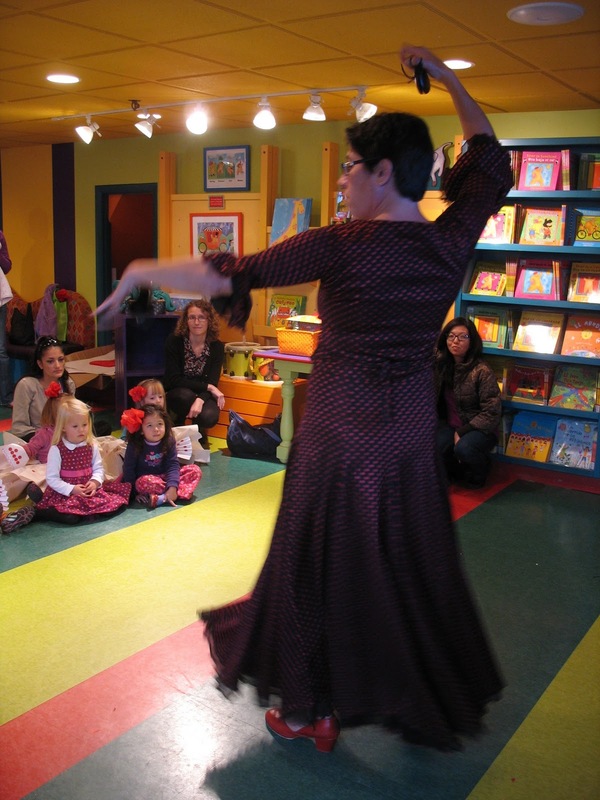 Categories: Childrens Flamenco, kids flamenco, youth flamenco | Permalink. Dancing is the best way of narrating a story. It was wonderful. I was invited to do a 3 year olds birthday party-the one who is quoted in the blog post-I read Lola's Fandango to all the party goers, we made fans and then I danced fr the guests and then we all danced with toy castanets and the fans we had made! It was so much fun for all!